England is known for its National Health Service. It is the largest and the oldest single-payer healthcare system in the world and with one fifth of its budget being spent on providing health care in London alone it would be expected that every person living in London is in equal good health since the service is available to every UK citizen and legal immigrant. But in Westminster this is not the case. Although the average for those who feel they were in bad or very bad health in Westminster 2011 was 6%, only 1% higher than the London average, there is huge variation within the borough that affects this average, for example in the Church Street ward this number rises to 11%, which is significantly higher than the London and Westminster averages. In 2013, Church Street ranked 537 out of 625 London wards on the GLA Well-being index which looks at a number of measures including health. This gives the Westminster ward one of the worst 25% of wellbeing scores in London. 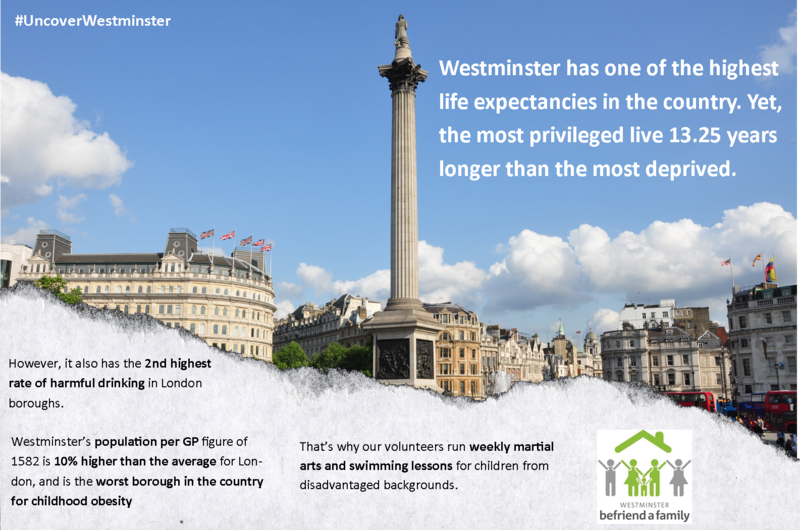 This huge inequality in health is also reflected in life expectancy in Westminster. The gap in life expectancy between the most and least deprived 10% of the Westminster population is 16.6 years for men (the largest gap in England) and 9.9 years for women (the fourth largest gap in England). There are strong links between poverty and health, as children in poor families are more likely to suffer from both physical and mental health problems which can be long-term and affect them throughout their lifetime. These children are also more likely to be injured or killed in an accident. Further, Westminster is the worst borough in the country for childhood obesity. The percentage of pupils, 5-16 years old, participating in physical activity in Westminster is 74.76, while the average for England is 83.36. At Westminster Befriend a Family we offer weekly community-based sports programmes, such as swimming and martial arts classes, to help to improve health. 64% of parents of children in our swimming classes ‘strongly agreed’ that they had noticed an improvement in the physical health of their child since they started the lessons. These classes not only have this amazing positive impact on the health of children but they also have many other benefits that have been outlined in previous posts in this series. Research also suggests there is a significant link between poverty and its contributing factors, and mental health. People in the lowest quintile of household income are nine times more likely to suffer from a psychotic disorder than those in the highest quintile. Suicide rates are much higher among those who are unemployed. There are key areas in which Westminster struggles with regards to health. Mental health appears to be an on-going problem. Inpatient admissions for severe and enduring illnesses are 59% higher than the national average. At Westminster Befriend a Family we offer coffee mornings for parents using our services, which have many benefits and emotional support, and counselling was outlined by more than 50% of coffee morning users as one of these. The coffee morning is “like a therapy”, one respondent informed us, a space where clients can go and share their experiences. We need to #UncoverWestminster to raise awareness of the inequality of health throughout London and particularly the borough of Westminster, as no one deserves to suffer in silence.